When one of the strangers—beautiful, haunted Akiva—fixes his fire-colored eyes on her in an alley in Marrakesh, the result is blood and starlight, secrets unveiled, and a star-crossed love whose roots drink deep of a violent past. But will Karou live to regret learning the truth about herself?" 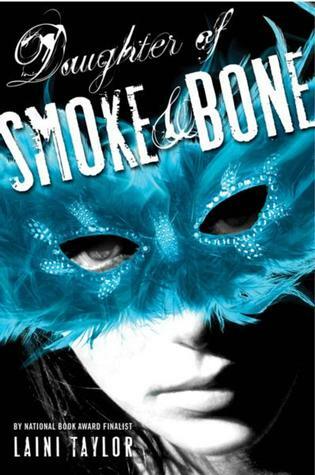 Daughter of Smoke & Bone is another FANTASTIC book! Laini Taylor crafted a lyrical tale that kept me entranced, reading this book over the course of a few days because I was unable to put it down. The writing is superb- each character is fully-fleshed and realized, with distinct personalities and drives. The main character is both frustrating and relatable, though far more badass than I am, and I was invested in her arc from page one. It has everything, from romance to war, friendship and family to secrets and fears. It's a fantasy, but grounded in modern-day Prague. The main character is a teenager, but the story is epic and has adult subtleties. It involves war but it isn't as simple as good versus evil. And did I mention the poetic language? I am definitely going to get the sequel, ASAP! I highly recommend Daughter of Smoke and Bone to fans of epic (non-sword-and-sorcery) fantasy tales, believers in the enduring magic of hope, those who love full-bodied adventure/romance tales, and poets.